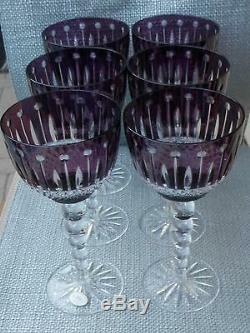 6 BEAUTIFUL AMETHYST / PURPLE CRYSTAL WATER/WINE GLASSES MADE BY AJKA. 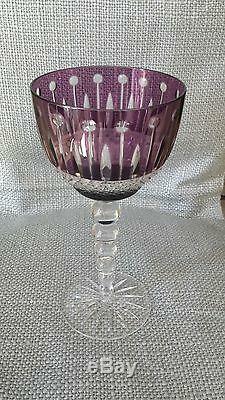 The pattern is FABERGE'S XENIA. These are all heavy well made glasses, the most beautiful addition to your holiday table. The glasses are 8.5" tall and 4" wide. 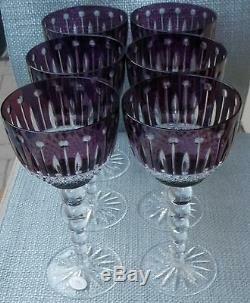 The item "SET of 6 PURPLE / AMETHYST CUT TO CLEAR CRYSTAL WATER/WINE GLASSES XENIA new" is in sale since Sunday, November 30, 2014. 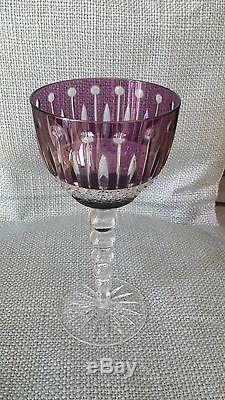 This item is in the category "Pottery & Glass\Glass\Glassware\Elegant\Other Elegant Glassware". The seller is "1butuska" and is located in Boca Raton, Florida.